So who has time to prepare food these days? We time-starved cooks need recipes that are guaranteed to be- Quick to fix, Easy for anyone to make, whether you're a cook or not, Delicious and satisfying. The solution? 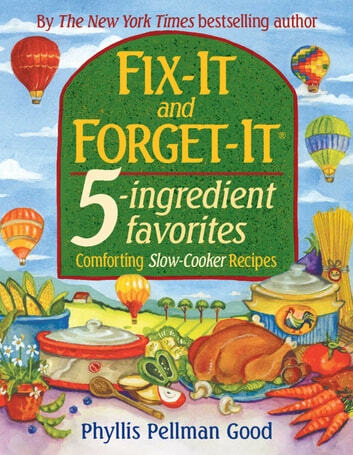 Fix-It and Forget-It 5-Ingredient Favorites-the latest member in the multi-million copy Fix-It and Forget-It cookbook series! This smart cookbook offers convenience and comfort to anyone faced with a too-full life and hungry people to feed. Gather five or fewer readily available ingredients + your slow cooker + Fix-It and Forget-It 5-Ingredient Favorites-and you can have- Apricot Chicken, Lazy Lasagna, Sweet and Savory Brisket, Bacon Feta-Stuffed Chicken, Tortellini with Broccoli, Upside-Down Chocolate Pudding Cake, Brownies with Nuts. 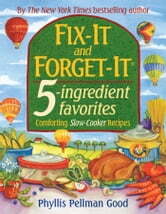 Fix-It and Forget-It 5-Ingredient Favorites, with its more than 700 recipes, can be your new faithful companion. Turn to it for Main Dishes, Meats and Pastas, Vegetables, Soups, Breads, Breakfasts and Brunches, Desserts, Appetizers, Snacks, and Beverages. From New York Times best-selling author Phyllis Pellman Good, who believes that it is possible to do home-cooking and to enjoy the great satisfaction it brings to those who cook and to those who eat.